The recent crisis had a large impact on labour markets in the Eurozone. Unemployment rose from 7% to 12%, yet nominal wages changed little. This seeming disconnect has been one of the key policy questions arising from the crisis. Furthermore, as unemployment fell in recent years but wages remained static, policymakers have been debating when the relationship between unemployment and wages will re-emerge. 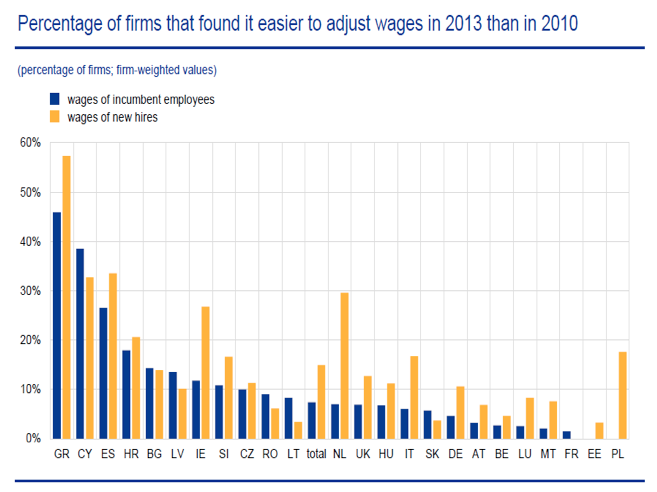 A number of studies have attempted to explain the behaviour of wages during the crisis, with some success (e.g. ECB 2015). Part of the problem is that the wages that enter into firms’ hiring decision are those of newly hired workers, and data on these wages are very rare. Two influential recent studies for the US by Haefke et al. (2013) and Gertler et al. (2015) reach opposite conclusions. In a recent paper, we consider whether aggregate data is masking large differences in the responsiveness of wages to aggregate fluctuations (Lydon and Lozej 2016). In particular, we show that the flexibility of new hires’ earnings in Ireland is much greater than that of existing workers. 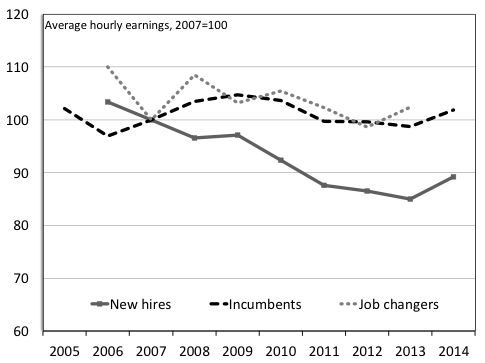 As a result, although in the aggregate earnings appear rigid, new workers have borne the brunt of cuts to earnings during the crisis. Our findings are in line with the findings for the US by Haefke et al. (2013) and in stark contrast to the recent findings of Gertler et al. 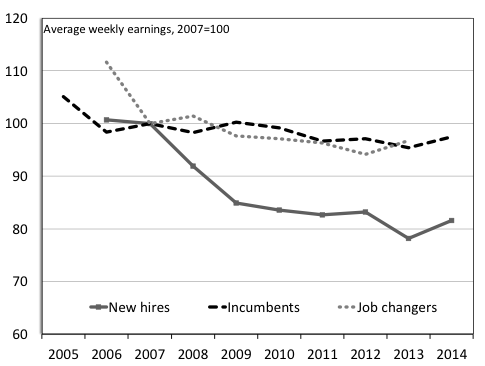 (2015), who find that wages of new hires are not more flexible than wages of incumbent workers. Here we describe our findings, among the first of their kind for European data, and discusses the implications. Using administrative data from ten years of tax returns, we construct a panel dataset of earnings for 5,000 employees in Ireland from 2005-2014. Data on individual characteristics are obtained by linking the tax data to the same individuals in the 2013 Household Finance and Consumption Survey. This allows us to address potential issues of compositional bias in the analysis – for example, if the productivity of new hires is also pro-cyclical. Notes: Earnings are deflated by the consumer price index (2013=100). Sample is workers aged 20-64 working a minimum of 26 weeks a year. Notes: Sample is workers aged 20-64 working a minimum of 26 weeks a year. A concern is whether compositional shifts can explain the observed patterns in the data – for example, if employer-employee matches during a downturn are in less productive jobs and/or for less productive workers. The ‘brain drain’ associated with increasing levels of emigration amongst highly educated Irish workers during the recession suggests that this might be an issue (Glynn et al. 2013). In the data, there is evidence of compositional shifts. For example, up to 2008, 42% of new hires had a tertiary education; by 2012 this had fallen to 36%. We address this concern using a variety of techniques including fixed effects and first difference regressions, and find that the results are robust to changes in the composition of new hires. One of the explanations for our result is that, as ‘outsiders’, the bargaining power of new hires is weakened during a downturn. The same argument can be applied within the new hire group. For example, a priori we might expect less educated or older new hires to have even larger semi-elasticities. This is exactly what we find (Table 1) – the semi-elasticity for older new hires (45+) is more than twice that of younger new hires (35-44); similarly, the semi-elasticity of new hires with primary schooling is almost twice that of those with a tertiary education. Source: See Lydon and Lozej (2016). All results in the table are statistically significant at the 5% level or lower. The sample for the results above is all workers aged 20-64. Using a database on weekly earnings in Ireland over a ten-year period, we find robust evidence that earnings of newly hired workers are substantially more flexible during the downturn than the weekly earnings of either incumbent workers or job-changers. The fact that our results are very much in line with those from similar studies in the US, as well as evidence on the flexibility of new hire pay in the WDN survey, suggests that our findings are not unique to Ireland. Aggregate wage data are typically less volatile than output or unemployment. This has been one of the reasons why wage rigidity is often used in search-and-matching models to generate sufficient volatility of labour market variables. However, as pointed out by Pissarides (2009), it is the wage of a newly hired worker that enters into the hiring decision. One important implication of our findings is that relying on wage rigidity to generate realistic volatility of job creation and (un)employment in macroeconomic models may not be an appropriate mechanism, as it is not consistent with the evidence on the micro level. We also find that the recent recession in Ireland induced substantial heterogeneity regarding the groups who bear the brunt of labour market adjustment. The evidence suggests that not only were the newly hired workers affected more than incumbents or job-changers, but that within the group of newly hired workers, those with worse outside options were more affected. While such developments may have prevented an even larger increase in unemployment in Ireland, they have likely led to larger and more persistent inequality, even for workers with similar jobs. Blanchard, O., F. Jaumotte and P. Loungani (2013), “Unemployment, Labour-Market Flexibility and IMF Advice: Moving Beyond Mantras”, VoxEU.org, 18 October. Conefrey, T. and R. Smith (2014), “On the Slide? 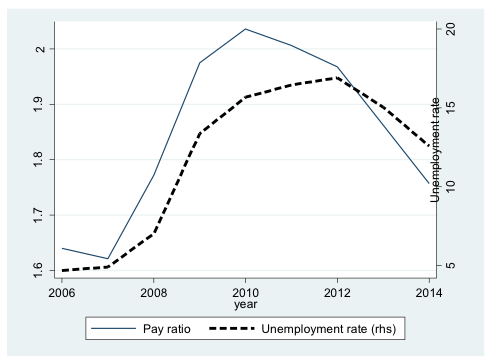 Salary Scales for New Graduates 2004-2012”, Central Bank of Ireland Economic Letter Series 14.1. Devereaux, M. (2001), “The Cyclicality of Real Wages within Employer-Employee Matches”, Industrial and Labor Relations Review 54(4): 835-850. ECB (2016), “New evidence on wage adjustment in Europe during the period 2010-13”, ECB Economic Bulletin 5/2016. ECB (2015), “Downward wage rigidty and the role of structural reforms in the Euro area”, ECB Economic Bulletin 8/2015. 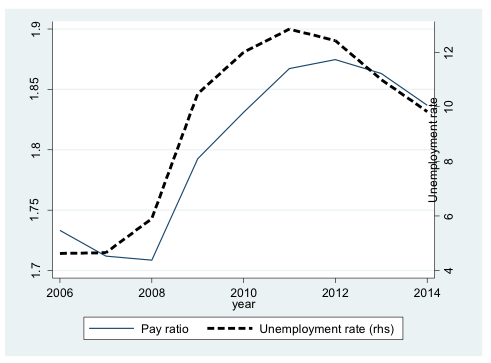 Gertler, M., C. Huckfeldt and A. Trigari (2015), “Unemployment Fluctuations, Match Quality and the Wage Cyclicality of New Hires”, Society for Economic Dynamics, 2015 meeting papers. Glynn, I., T. Kelly and P. Mac Einri (2013), Irish Emigration in an Age of Austerity, Department of Geography and Institute for the Social Sciences in the 21st Century, University College Cork. Haefke, C., M. Sonntag and T. van Rens (2013), “Wage Rigidity and Job Creation”, Journal of Monetary Economics 60(8): 887-899. Kawaguchi, D. and A. Kondo (2016), “How Much Do Young People Suffer when They Graduate During Bad Economic Times?”, VoxEU.org, 13 January. Lydon, R. and M. Lozej (2016), “The Flexibility of New Hires’ Earnings in Ireland”, Central Bank of Ireland Research Technical Paper 06/RT/2016. Pissarides, C. A. (2009), “The Unemployment Volatility Puzzle: Is Wage Stickiness the Answer?”, Econometrica 77(5): 1339-1369. Solon, G., R. Barsky and J. A. Parker (1994), “Measuring the Cyclicality of Real Wages: How Important is Composition Bias”, Quarterly Journal of Economics 109(1). Evidence from individual country reports participating in the WDN suggests a general reluctance on the part of firms to adjust base wages (of incumbents). Firms cite negative effects around morale, comparisons with other firms, productivity and effort as key reasons for avoiding such changes. See the publications on the WDN research page on the ECB website. We benchmark trends in our micro data against other official data sources, including the Irish Labour Force Survey. The two datasets track each other very closely. In our paper, we show that the fall in average weekly hours for new hires was slightly larger during the recession when compared with incumbents or job-changers. This is a common approach in the wage flexibility empirical literature. See, for example, Haefke et al. (2013), Gertler et al. (2015), Devereaux (2001), and Solon et al. (1994). We use annual unemployment rates for the eight NUTS III regions in Ireland from the Labour Force Survey. This is not what one would expect for older unemployed who are very close to retirement and can wait-out the unemployment spell. Our findings confirm this hypothesis.